5 Bedroom Semi Detached House For Sale in Redruth for £295,000. A deceptively spacious five bedroom family home located in the popular location of Park Road. 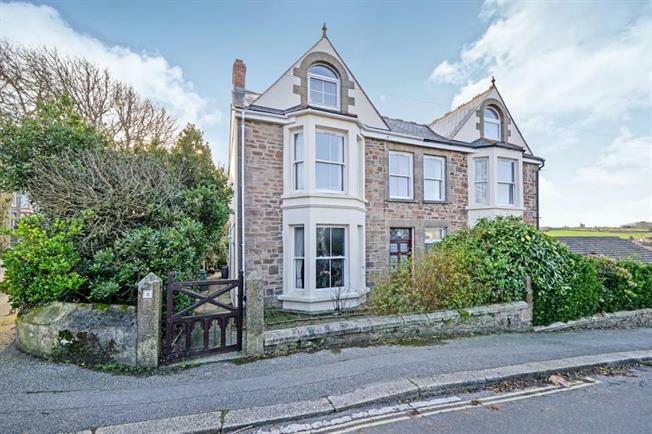 This property has undergone extensive renovation works and is laid out over three floors comprising an entrance hall, lounge, dining room, breakfast room, kitchen and utility room. There are four bedrooms situated on the first floor together with a bathroom and on the second floor there is a large master bedroom with dressing area and en suite. The property benefits from an enclosed good size rear garden, garage and parking. There is electric heating and double glazed upvc sash windows. Double glazed front door leading into the entrance vestibule and a stained glass door leading into the entrance hall. Stairs to first floor accommodation. Tiled flooring. Doors to lounge, dining room and breakfast room. UPVC double glazed sash bay window. Open fireplace. UPVC double glazed doors leading to the garden. Electric wall panel heater. UPVC double glazed door to the side and double glazed window to the side. Fireplace housing a multi furl burner. Tiled floor. Archway leading into the kitchen. Inset spot lights to the ceiling. UPVC double glazed doors opening to the garden. Wall and base units with work tops incorporating a stainless steel sink unit and drainer. Space for electric cooker and space for fridge/freezer. Breakfast bar. Tiled flooring. Door to utility room. UPVC double glazed window to rear. Wall and base units with work tops. Space for washing machine and dryer. Opening to w.c. Doors to first floor bedrooms and bathroom. Turning staircase to second floor. UPVC double glazed sash bay window. Electric wall panel heater. (needs completing) Shower tray. Close coupled w.c.. Wash hand basin. Tiled walls. UPVC double glazed window to the side with lovely views over Redruth, Carn Brea Castle and monuments and engine houses. Electric wall heater. UPVC double glazed sash window. Electric wall panel heater. Storage. P-shaped bath with shower above. Close couple w.c. Pedestal wash hand basin. Double glazed window. Tiled walls. UPVC double glazed window with lovely views of Redruth, Carn Brea Castle and monument and engine houses. Electric wall panel heater. Turning staircase from main landing. Storage. An irregular shaped room with dressing area. UPVC double glazed arched window. Sky light. Electric wall panel heater. Corner shower cubicle. Pedestal wash hand basin. Close coupled w.c.
To the front there is off road parking and a garage. There is gated access to the side of the property. The rear garden is enclosed by a wall and is laid to lawn with paved area. There is a raised area to the rear and the garden houses a garden shed.